Just as things were starting to dry out a bit, it rained last night. I guess it is better than snow because it drys up quicker. I keep hoping that the trail will have dried up enough to get some mountain biking in. Road biking is nice, and it helps keep you in shape, but it just not the same as mountain biking. After the rain there was fog. This isn't the greatest picture but it is the best that I got this morning. 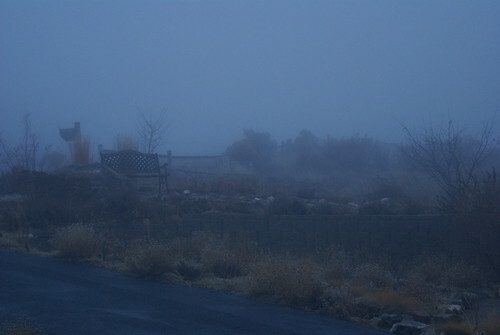 There were some great scenes of fog over the valley, but all I had available for those was my little Olympus camera, which just didn't do a good job of capturing the image.